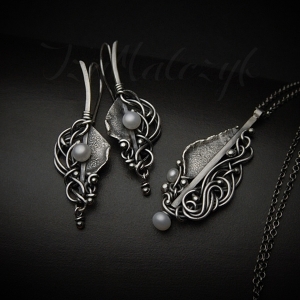 Unique, subtle but alluring jewelry set made by hand in oxidised and polished fine and sterling silver. Freshwater pearls add charm to this swirly composition. The earrings have long earwires and measure 5cm in total length and are 1,6cm wide. The pendant is 4,5cm long and 1,8cm wide. The chain is 44cm long plus 10cm of extension.